They weren't kidding when they said the release schedule was about to ramp up. There must have been some serious build up of creative juices going on at Mornington HQ while the new brewery commissioning was going on as we make this three new releases in a fortnight. This time around, it's a variation on a theme. 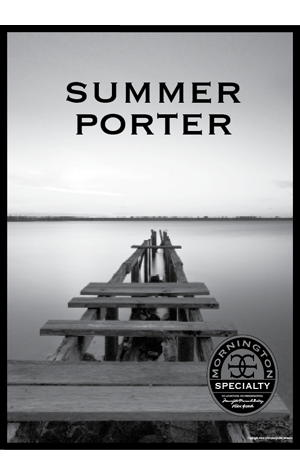 One of Mornington's earliest releases was their Porter, a beer that remains one of their finest but which also nudges at the top end of what a porter can be in terms of its bold flavours and relatively high alcohol. With the mercury on the rise, they've taken a different approach to the style, playing around with the recipe and coming up with a lighter version for summer. Hence the name Summer Porter. According to the brewers, it's designed as a warm weather dark ale, which translates as "an amalgam of chocolate, ice coffee and delicate fruit aromas lead into a light-bodied and flavoursome palate. A late flourish of chocolate and raisins combine with fruity hop flavours."